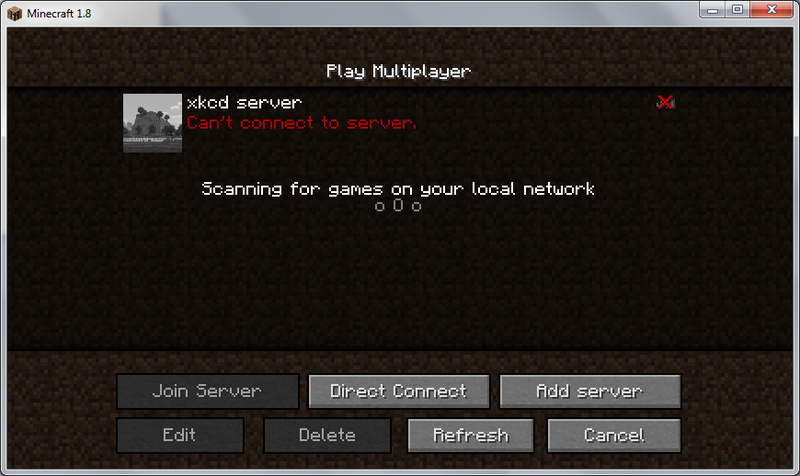 I may start playing again, but not having this server wouldn't be too big of a deal. ... almost got one that makes sense. New avatar from the webcomic Paranatural. Mr. Spender has weaponized bishie sparkles. I'd suggest carving some ramps and parking on top of the snow, but that would probably end horribly. Topic: How to "prove" any statement is logically true. Re: How to "prove" any statement is logically true. FancyHat wrote: Axiom 1: The original post is wrong. Axiom 2: Neither of these statements is true. suffer-cait wrote: I really need to see that movie. Who amongst you lives in seattle anymore? Free-to-play weekend on Steam, and it's only 99 cents right now. It's Team Fortress 2 with dinosaurs. I've been playing for hours and it's fun as hell. I'm named Jonathan but usually give my name as Jon, partly because it's shorter and partly because I want to see how they'll spell it. I get about 85% "John" and 15% "Jon". A river of molten bone sounds like a cool fantasy setting. Even if it doesn't really make sense. I thought the first half was good, but then it took a nose dive into the Nope Ocean. What's in that pot? Are they making fondue? I don't understand people who can face directly at the sun when they're posing for a picture. I'm squinting in nearly all of my family pictures. Yay, I correctly guessed what that acronym is. What about Santa Claus Conquers The Martians? You, sir, name? wrote: Alien and Die Hard is essentially the same movie, except from opposing perspectives. I didn't know Xenomorphs celebrated Christmas. Some of the keys on my laptop stop working every once in a while and you have to put pressure on a certain part of the keyboard to fix it. I think it's an issue with the ribbon cable underneath but it doesn't look like something I can fix. I'm planning on getting a new laptop as a graduation present. I sell obscenities and obscenity accessories. There's a kind of palm reading that reads butts instead of palms. And it's called Rumpology. I heard that the 0.B version of CataclysmDDA just came out, so I gave it a try. The starting scenarios are pretty cool and you don't have to start in a safe house anymore. There are also some good-looking texture packs. We should really bring back messages in bottles. It makes the world a weirder place. My favorite was "Fleeting/Random Thoughts (Random like the plague)". The Dong was pretty much the only reason command blocks were added. Edit: Is the server still down? I decided to start playing again so I downloaded 1.8... is the server down, or user error? Thesh wrote: Male hummingbirds use their beaks to stab each other in the throat. Snails do the same thing, but as foreplay. addams wrote: What the Hell is that paper about? Chickens doesn't look like a real word anymore. You know, like those fake words. They're just in it for the money. Good thing they got it before it reached stage seven (warning: nightmare fuel? ).